The Callaway Big Bertha fairway combines the new Hyper Speed Face™ Cup technology with advanced adjustable hosel and improved internal head weight positioning to deliver incredibly faster balls speeds, a larger sweet spot and amazing distance. The breakthrough head weight position of this fairway precisely locates the CG to optimize the launch and backspin across the entire face. The Hyper Speed Face™ Cup technology which is Callaway’s fastest, thinnest face to date and the modern, adjustable Big Bertha head design creates a versatile and forgiving fairway wood that produces insane distance. New Advanced Adjustable Hosel Technology allows a player to increase or decrease your loft (+2° and -1°) and adjust to a Draw or Neutral directional bias. Breakthrough head weight positioning allows Callaway to precisely locate the CG to optimize the launch and backspin across the entire face. 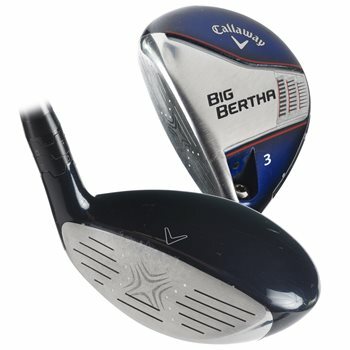 Modern and Adjustable Big Bertha fairway head design creates a versatile and forgiving fairway wood that produces insane distance. Review by dmist, 2 years ago.